The three main touring sites are Spruce Tree House, Cliff Palace, and Balcony House. Spruce Tree House is a self-guided tour. The others are ranger-led tours. For photography purposes, both the Spruce Tree House and the Cliff Palace face west, making them best photographed in the afternoon. In late April, when I arrived at Mesa Verde, Cliff Palace closed at 6:30 PM. The last tour for Cliff Palace was at 5 PM. I bought tickets for the 5 PM tour and stopped off at Spruce Tree House around 3:30 in the afternoon. 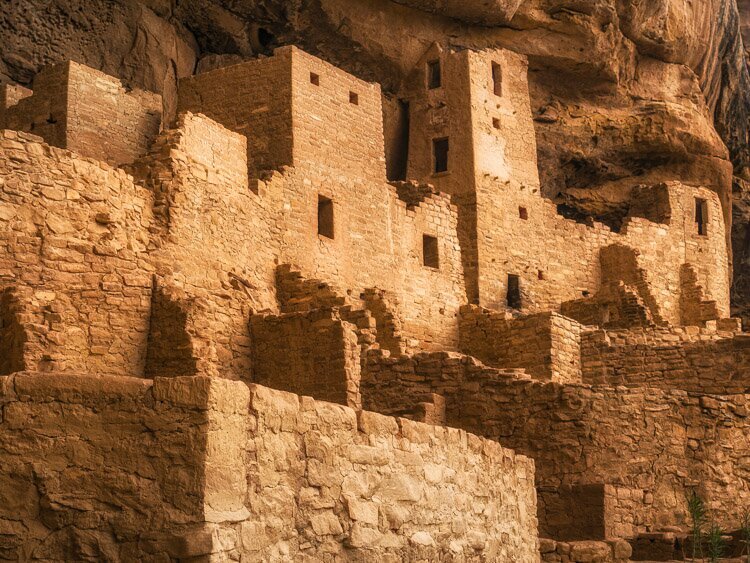 Building square towers was all the rage with the people who constructed these cliff dwellings. My favorite of the ruins is the appropriately named “Square Tower House.” These are not ruins that are easily visited. There used to be ranger led hikes to this location, but there don’t seem to be any scheduled for 2013. Going to one of these ruins without supervision is illegal.